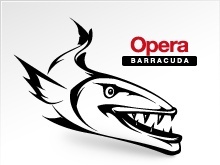 The first Alpha development of the Opera 11.10 tagged as “Barracuda” is here. The Norway-based browser vendor, Opera Software, introduced the latest version with Build 2005 for early adopters who want to taste the future version of the browser available in Alpha. Although the Opera 11.10 has bee made available for download, users have been advised that the release is in its Alpha phase which is designed for testing environments and should not be deployed as the default browser, due to various problems and crashes are expected to arise. In this build, Core has been upgraded from version 2.7.62 to 2.8.99, which is a pretty big step forward. With this Core upgrade comes the implementation of the Web Open Font Format (WOFF). In addition, a batch of changes to network compatibility has been implemented. The purpose of these changes is to modify our network behavior so that we are more compatible with other web browsers. Moreover, the Opera 11.10 “Barracuda” Alpha Build 2005 will not be able to deliver HTML5 media playback on Mac.